For a food that’s been around for so long eggs are surprisingly steeped in controversy. For the health and budget conscious foodie there’s a lot to love about eggs. They’re cheap, low in calories, easy to cook, and filled with a lot of nutrients that are otherwise difficult to find: the full spectrum of B vitamins, omega 3’s, acetylcholine, zinc, copper, biotin, and more. The only other real alternative to get these in one food is a big helping of meat, but a lot of people would prefer not to go that way (myself included). Eggs have also stood the test of time. They’ve been used in recipes for centuries, possibly for as long as humans have been on earth. But despite all this goodness eggs are more steeped in controversy than ever before. They’re white. They’re brown. They’re not vegetarian or vegan, and they have lots of cholesterol. Really good looking health guru’s are shunning them. Can you eat them if you have heart disease? Should you include or avoid the yolks? AND WHAT ABOUT ALL THOSE DAMN CERTIFICATIONS?! You can buy your eggs regular-style, cage free, free range, organic, with omega-3’s, without antibiotics, and vegetarian (how can the larvae of a chicken be vegetarian?!?!!) to name only a few. The bottom line is this: eggs are still a great food on their own merits. Yes, you can eat too many of them, but that’s true for practically anything but spinach. Let’s lay the gauntlet to the egg nay-sayers once and for all. Starting sometime in the 70’s it became generic advice that it was better to eat egg whites instead of the yolks. The thinking was that the egg whites had more of the protein and less of the fat, and all the cholesterol was found in the yolks. It emphasized a few well defined facts over its use in biological systems. 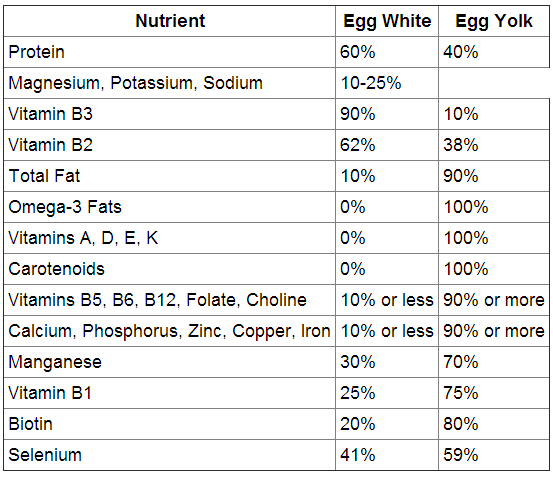 When the nutrients in the egg are being used to bring a young chicken larvae to adolescence is only the egg white being used? Does mother nature simply discard the yolk because it has too much cholesterol? Of course not. It uses the egg yolk, and for good reason. As you can see, the yolk stacks up very well. It also illustrates a surprising point about getting the most out of your food: When you’re looking to maximize nutrients follow the fat. This might seem counter-intuitive since we’ve been indoctrinated to think of fat as bad, but one of fat’s many functions is to serve as an irreplaceable delivery mechanism for nutrients into our tissues. Healthy nails, shiny hair, vibrant skin, and strong teeth all require certain minerals and compounds to shuttled into their cells via fat. It’s indisputably true that eggs are high in cholesterol. And yes that means for many people you’ll need to curb your egg consumption. But cholesterol, like any other physiological variable, exerts its effect in a very path dependent manner. That means the effect of the cholesterol you eat through your diet is modified by the relative amounts of other nutrients and physiological conditions happening in your body. For most healthy people cholesterol utilization is relatively constant because your body modifies how much cholesterol it makes depending on how much of it you eat. Of course not all of us are healthy. And that’s where the problem (and emphasis) with cholesterol comes into focus. Between our lack of sleep, out of whack sodium/potassium ratio, and rampant insulin insensitivity most of us carry on in an environment of persistent inflammation. An inflamed body won’t do a very good job of utilizing the cholesterol that it has (particularly those carried in LDL particles) and might show signs of wear and tear if it gets too much. Many people (and most vegans) will think this is smoking-gun proof that cholesterol should be avoided…..but the problem isn’t cholesterol itself. In fact, a malfunctioning body is going to be thrown out of whack by pretty much any nutrient excess that isn’t easily excreted by the body (ie, water soluble). But the facts suggest that when studied in isolation, eggs all by themselves aren’t a gigantic culprit. There’s a decent amount of epidemiological and clinical data that suggest moderate egg consumption doesn’t negatively affect metabolic risk factors. Are eggs completely absolved from suspicion? No, of course not. People respond to dietary cholesterol in different ways, and if you’re already knee deep in metabolic syndrome then piling on more eggs is a bad idea. For many people there are different thresholds of egg consumption that will eventually cause you harm. (For some this could actually be quite high). But for most of us an occasional egg will not cause harm. 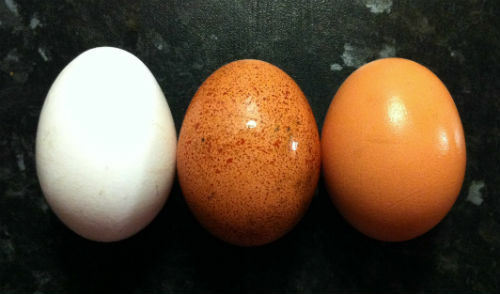 Cheap eggs are usually white, and expensive eggs are usually brown. Does this have anything to do with the quality of the egg itself or is it just farmwashing to make people feel better about paying $5 for something that cost $0.79 at the beginning of the 21st century? In this case it’s the latter. Egg color means nothing about the egg itself (at least in the grocery store) and they’re bred that way to help differentiate products and give more expensive ones more curbside appeal. Cage-Free, Organic, and Free Range, Oh My! Even if we can all agree that eggs are okay (or at least not worthy of being maligned), it still leaves us with the curious problem of what to do at the grocery store. I hate to sound old fashioned, but MY GOODNESS! WHAT HAPPENED TO THE DAYS WHEN AN EGG WAS JUST AN EGG?!?! Cage Free. About what it sounds like. They’re not grown in cages. 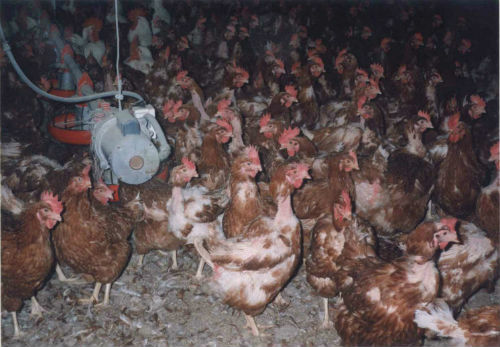 However, don’t mistake being cage free with being comfortable, humane, or free of other inputs to the egg-making process that might make you cringe. This is probably better than the status quo for most chickens, but not exactly Club Med. Free Range. Free range hens and chickens are uncaged and allowed outdoor access on a daily basis, albeit with little clarification beyond that. Uncaged and outdoor access means the chicks’ll have the chance to engage in a variety of natural behaviors that presumably mean they’re healthier and happier when they’re alive, which usually means healthier animals when you eat them. Organic. Similar to free range, but with more formal certification. To be certified organic chickens have to be uncaged and allowed some degree of outdoor access and can only be fed certain types of feed. It’s important to understand that organic restricts the use of pesticides, but doesn’t ban them altogether. The organic standard also regulates a production process, but not necessarily specific levels of quality as a final output. In general, the best rule of thumb is to eat animals that had a decent life when they were alive. If you have no other choice but your neighborhood grocery store then organic is probably the way to go, but local farms are probably better if you have the chance. (And yes, I know that most of us don’t). Previous Post Channeling Kris Carr: When Should You Cut Out Your Cup of Coffee?